Danbury won its second straight FCIAC championship — and seventh overall — on February 3 at the Zeoli Field House in Wilton, taking a 4.35-point win over Fairfield Ludlowe. The Hatters won with 88.7 points. The Falcons took second at 84.35 with Fairfield Warde taking third with 82.35. It was the second straight season that the Falcons placed second. 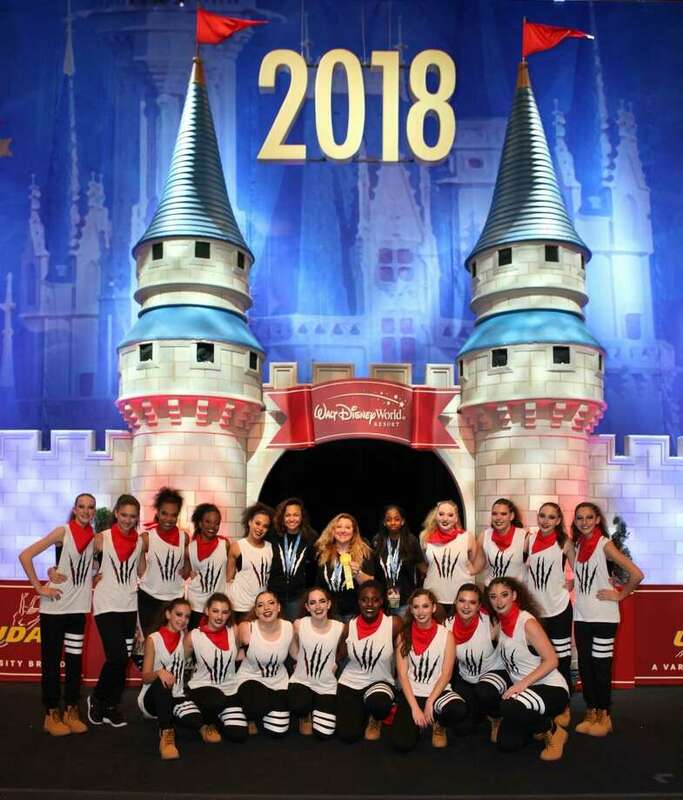 Ludlowe had 10 seniors on its 16-member performance group and while second place might be a letdown, the performance was championship-caliber. Ludlowe’s Partner Stunt competition squad won the league championship as Rachel Fox, Alyssa Hogarth, Emma Kortmansky and Kelly Repaci finished atop the field. Warde’s team of Natalie Closson, Alexandra Ludlow, Catherine Potenza, Brooke Powning and Erin Scheller was second. Ludlowe’s Rachel Fox, Kelly Rapaci and Caroline Placey, along with Warde’s Maddie Rodriques, Christina DeNatale and Erin Scheller were named All-FCIAC cheerleaders. Ludlowe defeated Norwalk 44-33 on January 31. Winners for the Falcons were: Luis Zambrano (108) by forfeit; Yuri Case (113) by 14-8 decision; Antonio Nicholas (126) by forfeit; Adam Arnaout (134) 21-4 technical fall; Skyler Kwok (140) by pin at 2:46; Zach Taylor (147) by pin at 3:13; Justin Hathaway (184) by pin at 5:08 and Stan Goldlewski (197) by pin at 3:39. Warde defeated New Canaan 54-22 on January 31. Winners for the Mustangs were: Dylan Cruvinel (106) by 4-0 decision; Shurki Reber (113) by forfeit; Cole Shaughnessy (120) by forfeit; Nathan Cuoco (126) by pin at 1:19; Noah Zuckerman (145) by pin at 3:43; Anthony Zarlenga (152) by 8-6 decision; Izaake Zuckerman (160) by pin in 0:26; Chris Gjinaj (170) by forfeit; Joe Gjinaj (182) by pin in 3:57 and Matt Cerminaro (195) by forfeit. The Mustangs kept up the winning ways, sweeping a quad meet against Trumbull (43-30), Stamford (75-0) and Fitch (56-23) to improve to 17-1 on the season. Winners against Trumbull were: Reber Shurki (113) by forfeit; Cole Shayghnessy (120) by forfeit; Alex Steele (132) by 11-3 decision; Anthony Zarlenga (145) by 3-1 decision; Kris Gjinaj (152) by pin 2:49; Izaake Zuckerman (160) by 3-1 decision; Dan Mundle (220) by forfeit; Alec Nardone (285) by forfeit. Winners against Stamford were: Dylan Cruvinel (106) by pin 3:55; Reber Shukri (113) by pin :59; Cole Shaughnessy (120) by 8-0 decision; Nathan Cuoco (126) by 11-4 decision; Alex Steele (132) by pin 3:34; Luke Bender (138) by pin :43; Anthony Zarlenga (145) by 20-5 technical fall; Kris Gjinaj (152) by pin 1:03; Izaake Zuckerman (160) by pin 2:39; Matt Cerminaro (170) by pin 1:26; John Summers (182) by forfeit; Joe Gjinaj (195) by forfeit; San Mundle (220) by 3-2 decision; Alec Nardone (285) by pin :27. Winners against Fitch were: Dylan Cruvinel (106) by 5-4 decision; Cole Shaughnessy (120) by pin :37; Alex Steele (132) by pin :30; Ryan Dean (138) by pin 1:43; Kris Gjinaj (152) by 22-6 technical fall; Izaake Zuckerman (160) by pin :22; Matt Cerminaro (170) by pin 1:03; John Summers (182) by forfeit; Joe Gjinaj (195) by forfeit; Alec Nardone (285) by forfeit. On Tuesday, Warde won the FCIAC East title, improving to 18-1 on the season with a 63-18 win over Staples. Winners for the Mustangs were: Dylan Cruvinel (106) by pin 1:10; Nathan Cuoco (126) by forfeit; Cole Shaughnessy (132) by pin 3:31; Alex Steele (138) by forfeit; Anthony Zarlenga (145) by pin 5:11; John Sullivan (152) by 10-6 decision; Kris Gjinaj (160) by pin 1:57; Izaake Zuckerman (170) by pin; Matt Cerninaro (182) by forfeit; Joe Gjinaj (195) by forfeit; Dan Mundle (220) by forfeit. Notre Dame-Fairfield defeated East Catholic 8-0 on January 31, improving to 8-4 on the season. AJ Bouvier and Ryan Schmidt each scored two goals for the Lancers, with Nate Stiles, Tommy Kuryla, Chris Becker and Kris Shkreli also scoring. Assists went to: Shkreli (4), Kuryla (2), Becker (2), Jason Ziegler and Gibby Ehalt. Kacy Adams made 20 saves en route to the shutout. ND-Fairfield defeated Guilford 6-2 on January 31 to move to 7-6 on the season. Desiree Sleath scored two goals for the Lancers, with other goals coming from Katelyn Pond, Ashley Graichen, Anna Scovill and Leigha Howland. Assists went to: Graichen, Howland, Bridget Maygar, Sierra O’Keefe, Justina Holland and Madison David. Rebecca Paine made 16 saves in goal. On February 2, ND lost to Hamden 4-1. Katelyn Pond scored the Lancers goal with assists coming from Alexis Burwell and Rose Linkasamy. Rebecca Paine made 31 saves in goal for ND. On February 3, the Lancers dropped a 3-0 decision to the Branford co-op team. Rebecca Paine made 30 saves in goal. The Fairfield co-op lost to New Canaan 3-0 on February 1 at the Wonderland of Ice. Mustangs goaltender Sidney Falterer made 47 saves. On Monday, Fairfield defeated Trumbull-St. Joseph 8-4 at the Wonderland of Ice. Samantha Henchcliffe scored two goals for the Mustangs, with Grace Flink, Sophia Mughal, Caroline Pratt, Caroline Coccaro, Olivia Nye and Jessica Pitaniello also scoring. Assists went to: Mughal (4), Pitaniello (2), Henchcliffe (2), Ella Grace Holland (2), Zhenna Milo, Julia Minichini. Sophia Guerrera made 21 saves in goal for Fairfield (7-7). The Fairfield co-op team lost to the co-op team from Westhill-Stamford 95-76 on January 31 at Westhill. Winners for the Mustangs were: Jack Mocarski (200 freestyle) 1:54.05; Mocarski (500 freestyle) 5:08.08; Greg Long (100 breaststroke) 1:17.33 and the 400 freestyle relay team of Connor Calarco, Gordon Dolynchuck, Andrew Huang and Mocarski in 3:59.34. Warde rolled past Trinity Catholic 71-40 on February 1 in Stamford. Olivia Parisi scored 25 points and grabbed 17 rebounds to lead the Mustangs with Cat Allison scoring 11, Aleysha Henry scoring nine and Caroline Aufiero and Kristina Krasniqi each scoring eight. Krasniqi added six steals while Allison had 10 rebounds and five assists. Ludlowe defeated Darien 46-34 on February 1 for its fifth straight win. Bridget Paulmann scored 21 points to lead the Falcons (8-8) with Bridget O’Leary scoring nine, Anna Paulman and Erin O’Leary seven each. Ludlowe qualified for the Class LL tournament with the win. On Tuesday, the Falcons won their sixth straight, 60-33 over Westhill. Bridget Paulmann scored 15 points with Erin O’Leary adding 11, Anna Paulmann eight and Amanda Schramm seven. Ludlowe is 9-8 on the season. Notre Dame-Fairfield defeated Barlow 62-32 on Tuesday in Fairfield. Erin harris scored 17 points, Yamani McCullough scored 16 points and Gabby Joseph eight to lead the Lancers. Zuquila Mbachiantim had seven. Ludlowe won an eight-team meet on February 3 at the Gymnastics & Cheer Center in Fairfield. The Falcons (134.95) defeated Newtown (132.65), Oxford 9132.05), Warde (123.65), New Milford (121.45), Foran (118.30), Westhill (110.40) and New Canaan (101.70). Individually, Ludlowe’s Ava Mancini won the vault with a score of 9.15 with Warde’s Tess Vincent tying for third at 9.0; Mancini tied for first place on the balance beam with a score of 9.2 with Vincent finishing second at 9.0; Ludlowe’s Olivia Hurst was third on the floor exercise at 8.8. Stamford became the first team all season to hold Sean Conway under 20 points and the Black Knights defeated Warde 59-54 on Tuesday. Conway scored 13 points with Matt Becker adding 11 and Malcolm Brune and Jeff Seganos both scoring 10. The Mustangs 42-33 after three quarters but Stamford used a 26-point fourth to steal with win. Notre Dame-Fairfield improved to 15-0 on the season after a 91-44 win over Joel Barlow Tuesday night. Stone Appleberg led ND with 20 points, Josh Reaves had 19, Noreaga Davis had 13 and Damion Medwinter 12 for the Lancers, who were without guard Tyler Bourne. Rodney Medor had 10 points. Patrick Killbride scored 11 points, including six in overtime as Ludlowe posted its second win of the season, 54-48 over Westhill in Stamford. Cooper Nielsen had 13 and Jadyn Tabois 10 for the Falcons. Ian Bentley added seven and jack Began six for the winners.